Abersoch’s favourite crabs tackle a Christmas mystery! Tim the Boatyard looked out over Abersoch harbour scratching his chin. He looked puzzled. Snow was falling slowly and softly on the boats snugly wrapped up in their winter home. 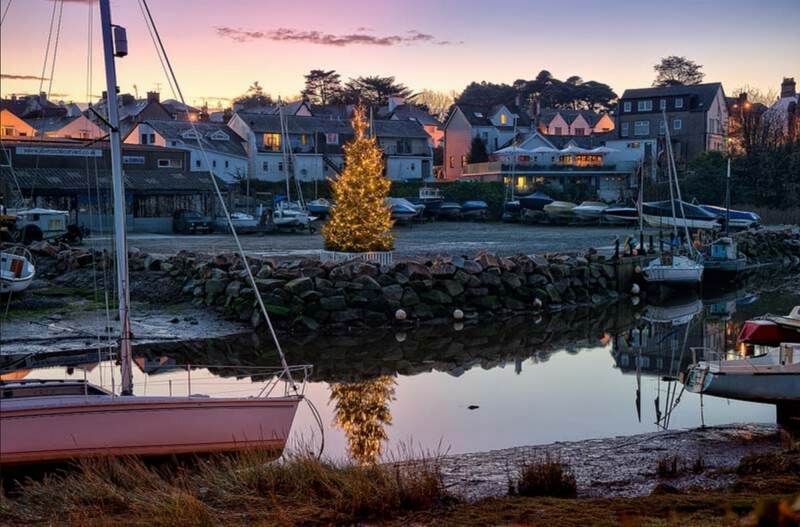 Christmas was coming to Abersoch and everything seemed perfect. But something was missing and he just couldn’t work out what it was. Then he realised. The Abersoch Christmas Tree had gone! Every year a new Christmas tree went up in the harbour, festooned with lights and decorations. Every visitor coming into the village was greeted by it, every villager loved it. Abersoch’s very own ‘Happy Christmas’ tree. Just two days ago, Tim and Huwie had dug a big hole in the boatyard and planted the tree. Now it had gone! Malky the Muddled Up Crab could not believe his luck. He’d been having a little explore in the harbour, watching with muddled up amazement as the first snowflakes he’d ever seen fell onto the sea. Now he had just heard the most amazing bit of gossip ever. Calvin the Crab had climbed onto his Thinking Rock and lowered his sunglasses down over his eyes. Many years before, a clumsy crab catcher had dropped his sunglasses into the sea. Ever since then, when Abersoch had a problem, Calvin would slip on the sunglasses, climb onto his Thinking Rock and think and think and think, until he worked out what to do. Right now he had a lot of thinking to do. It was the Abersoch Christmas Festival tomorrow and you could not have the Festival without a Christmas tree. His friends, the twins Jess and Jake, would be heartbroken and so would all the villagers and all the visitors. 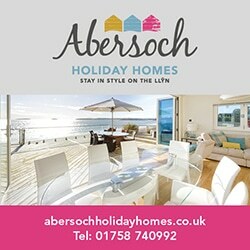 But where had the Abersoch Christmas tree gone? Who had taken it? How would they get it back? Even from high up on his Thinking Rock he could hear Malky talking nonsense, “Oh yes, I’m telling you, the tree has been taken by Pirates. I distinctly heard Tim the Boatyard saying so.” Calvin very much doubted Pirates had taken their tree but it was still a mystery that needed solving. It was dark when Jess and Jake came into the village in the car with their Mum and Dad. The twins had their noses glued to the car window as they approached the harbour. “First to see the tree gets a hot chocolate,” said their Mum with a smile. “Its right there…… ,“ cried Jake as they arrived in the harbour. But the words had stopped on his tongue. There was no tree. A big hole but no tree! The twins looked at each other. They could not believe what they were seeing. They had been coming to Abersoch for ten Christmas’s now and there had always been a Christmas Tree. This was a mystery that needed solving. Fast! The winter sunshine was streaming down onto the harbour wall as Jess and Jake enjoyed the first morning of their Christmas holiday. They had cast out their crab lines and were waiting anxiously to see their friends – Calvin and Cerys. Within minutes they’d each felt a tug on their line. Now here was Calvin, sunglasses shining in the sunshine, being lifted carefully onto the harbour wall by Jake, closely followed by Cerys coming in to meet her friend Jess. ‘We don’t know,’ thought Calvin. ‘But we’re going to find out.’ He waved his claws out to sea and then made a sweeping motion that covered the entire bay. “Are you getting all the crabs together?” asked Jess. “A search party?” squealed Jake excitedly. Now it was Calvin’s turn to nod. “You’re going to find the tree?” said Jess. The two crabs nodded together. Tim looked worried. He knew all about Calvin and Cerys and the mysteries they had solved but this was a big one. There was only one day until the Christmas Festival. Things didn’t look good. Calvin stood tall on his Thinking Rock, sunglasses on, claws waving to silence the chattering crab army stretched out across the seabed as far as the eye could see. The crab army let out a great roar, waving their claws in unison. Calvin was taking them on another adventure and they were going to save Abersoch’s Christmas. 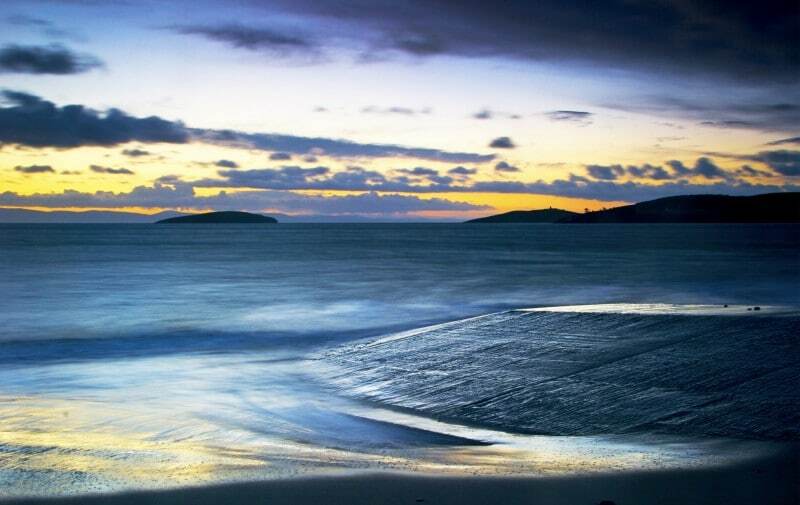 That night, after darkness had fallen and everybody on the peninsula was fast asleep, if you had been about in Llanbedrog, Pwllheli, Aberdaron or Abersoch itself, you would have seen sights you would never have believed. Team after team of crabs, hard at work. Small and large, every colour you could imagine, emerging from the sea to search every nook and cranny in every village. Their tiny claws leaving miniature claw-prints in the soft winter snow, scuttling and skidding across the frosty pavements, searching desperately to find Abersoch’s missing tree. Out to sea, scuttling just as quickly along the sandy bottom, little groups of crabs scoured the ocean for any sign of the tree. Every headland, every reef and every beach they searched, leaving not a stone unturned as their claws and sharp eyesight dug and looked for any place it could be hidden. As the night drew on and messages came back from every search party that the tree was nowhere to be found, Calvin and Cerys called their best friends together. Max the Maximum Crab, the biggest, strongest crab on the seabed and Mia the Mini Crab, tiny but brave, were going to join them in one last attempt to find the missing tree. The four crabs huddled together and each held out a claw, one on top of another. “Crabs together! Crabs forever!” they cried in unison, then set off on the long trek over the bay. “It’s not here,” said Max shaking his shell. They had covered every inch of St Tudwals Island West and the tree was nowhere to be found. The four crabs were exhausted from crossing the bay under the big winter waves and now they were going to have to cross the dangerous, wave-lashed waters out to the far island. “Let’s join claws,” said Cerys. The little chain of crabs made their way together deep down along the seabed, buffeted and bashed by the waves above, the strong currents swirling around them, threatening to knock them off their claws at any moment. Finally they arrived. Calvin put a claw to his lips and lifted himself up onto the rocky shore of St Tudwals Island East. Dawn was breaking as he waved to his friends to follow him. They no longer had the cover of darkness, this was dangerous. They climbed higher and higher up the island and then they saw it! The sign! ‘Pirate Pete’s Christmas Tree sale’. Right on the top of the island was a huge pile of stolen Christmas trees. Lying on top of the pile, still covered in its decorations, was the biggest and best tree on the pile. 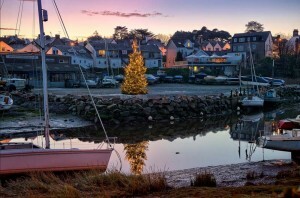 The Abersoch Harbour Christmas tree. For once in his muddled up life Malky had been right! This called for reinforcements. Once the message had been passed on, over the sea they came. Claw in claw, pincer in pincer to protect them from the stormy seas, an endless line of crabs. The entire crab army, determined to save Abersoch’s Christmas. Cerys and Mia led a little team of crabs who scuttled across the island and, on the count of ten, cleverly used their claws to each lift a peg from the ropes holding up the tent where Pirate Pete and his gang were hiding. As the Pirates thrashed around, trapped in the collapsed tent, the rest of the crab army took their places under the tree, each crab taking the weight of a branch or a decoration. Under the trunk was Max the Maximum Crab who, with a shout of ‘heave’, gave a great lift of his huge, hard shell and started to move the tree down towards the sea. The tree looked like a giant hairbrush, creeping down the island on the shells of a thousand crabs. Meanwhile, the pirates trapped in their tent shouted muffled threats at the fast-disappearing crabs and their prize tree. Down the side of the island went the crabs, bearing their prize, slipping into the sea with barely a splash. Calvin, the weight of a big branch across his shell, called over to Ronald the Running Crab, the fastest in Abersoch Bay, to send him on ahead with a message for Jess and Jake. If he scuttled and sprinted he could be there before the Festival. Meanwhile the crab army began their long trek back across the bay, a huge, heavy tree resting on their shells and the spirit of Christmas in their hearts. With just an hour until the start of the Christmas Festival, Abersoch was a sad little village. Everybody was preparing for the Christmas Festival but it just wasn’t the same. Whoever heard of Christmas without a tree? Tim the Boatyard was standing looking at the hole where the tree had once proudly stood, a disappointed look on his face. Every eye turned to look at the water. First they saw a trunk emerge slowly from the sea. The crowd gasped. Then branch after branch, decoration after decoration, slowly appearing out of the sea on the shells of a thousand crabs, lead by an exhausted looking Cerys and Calvin, his sunglasses still perched over his eyes. Finally, as the top of the tree emerged and the star that sat on its tip twinkled in the Abersoch moonlight, a huge cheer came from the crowd. “Crab army! Crab army! !” they roared. “Calvin! Calvin!! Calvin!!! Cerys! Cerys!! Cerys!! !” they cheered. Tim and Huwie sped across the boatyard in their tractor and in a flash the tree was sitting proud in its hole. With a wave from Jake, Jess flicked a switch and the Christmas Tree lights flickered and shone, lighting up the harbour, the freshly falling snow and the faces of the hundreds of happy Festival-goers. “It really is a miracle of Christmas,” said Jess and Jake’s Mum to their Dad. She tried to pretend it was the snow falling that had made her cheeks so wet, but she knew it was tears of happiness. “I think they mean Merry Crabmas!” said Jess to Jake, a big Christmas smile lighting up her face.